A stylish, environment-friendly, low-cost LED light source. You will be impressed and delighted by its reasonable price and wide range of appealing features. Elegant and adjustable design, full touch control panel, patented led lights, eye care first. Made from eco-friendly material, 6 graded energy efficiency, energy saving. Water or litter on the panel may disable the touch screen function. Smart Touch Control Desk Lamp with 4 modes: Touch the highly-sensitive buttons, freely choose from reading, study, relaxing and sleep modes in different occasions, compact and easy to use. 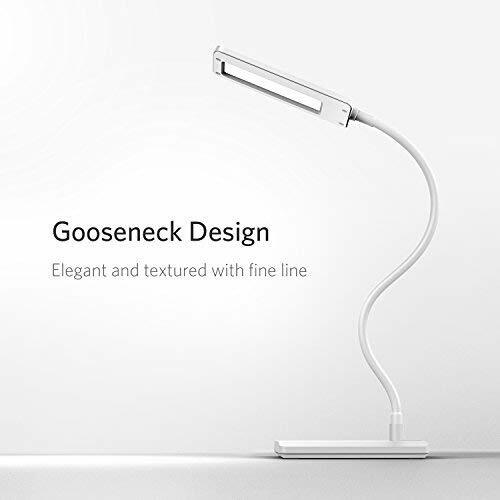 Flexible Gooseneck Lamp: With a 371.5mm/14.6 inch long gooseneck telescopic arm, the lamp can be 360-degree adjusted for a comfortable viewing angle. LED Reading Light: Side emitting and flicker-free technology offer soft and natural light, effectively protect your eyes. Long Life: Expected life of this model is around 40,000 hours. In other words, this lamp would last about four and a half years if it were used all day, every day. Warranty: All BESTEK products come with a 30-day money-back guarantee, an 18-month warranty and a lifetime of friendly customer service!